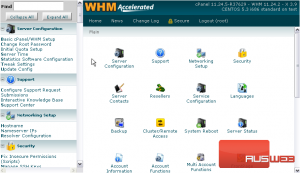 Demo Mode can be activated on any cPanel account through WHM. 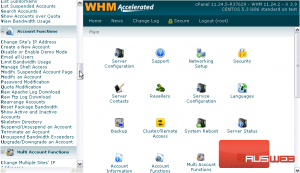 An account in demo mode restricts the user’s ability to alter files and folders but still appears to be a fully-functional cPanel account. This allows you or your resellers to show prospective clients what their account(s) will look like. 1) To enable Demo Mode, find the Account Functions section. 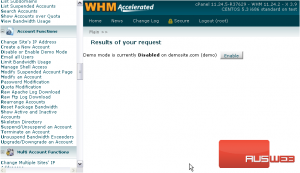 2) Click Disable or Enable Demo Mode. 3) Select the main domain or username of an account from the list, or search for an account below. 5) Demo mode is currently disabled on this account. Click here to enable it. 6) That’s it! Demo Mode has now been enabled. To disable demo mode, return to the exact same page; the button will have changed to Disable. This tutorial is now at an end. 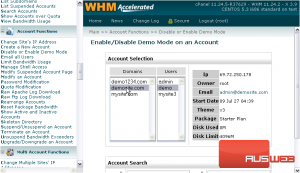 You know now how to enable demo mode on an account in WHM.